The Gulf State Park Enhancement Project, which aims to be an international model of economic and environmental sustainability, has announced that it is beginning work on restoring the equivalent of more than 50 football fields of dunes that were flattened from Hurricane Ivan in 2004. The dunes work is part of a broader effort to restore the park in the wake of the damaging 2010 Deepwater Horizon Oil Spill. The Gulf State Park Enhancement Project has assembled a skilled team of scientists, designers, planners and local experts to create a dunes system that encourages a connection to nature and maximizes the ability for that system to provide storm protection for people, as well as restore the habitat for beach mice, nesting sea turtles, and shore birds. The project team will create pathways through an existing engineered berm to facilitate movement of sand from primary dunes to more inland dunes, while also using sand fencing and recycled Christmas trees to catch sand, allowing the dunes to grow naturally. 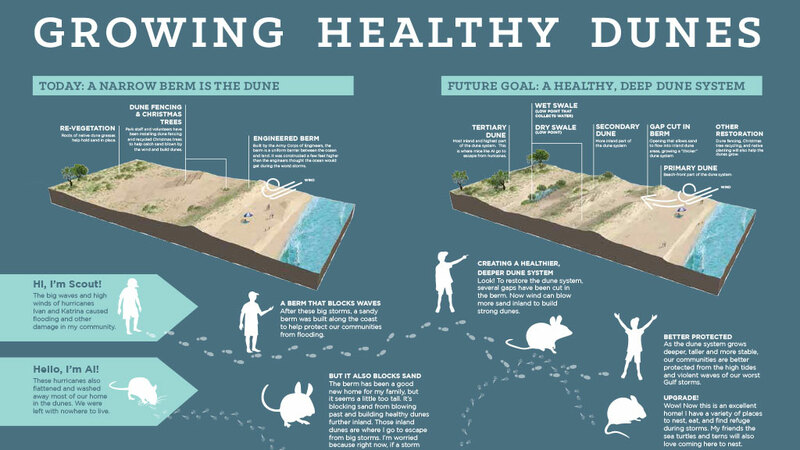 In addition, the project will replace invasive species with native plantings to stabilize the dunes and increase sand coverage. Learn more about the details of Gulf State Park’s dunes restoration process in this video. This week, the Gulf State Park Enhancement Project began soliciting bids for its dune restoration work. Overall, the Gulf State Park Enhancement Project will provide ecologically sensitive enhancements to Gulf State Park, a 6,150-acre park located in Baldwin County, Alabama. This stretch of coastline runs from Gulf Shores to Orange Beach, and it is operated by the Alabama Department of Conservation and Natural Resources. In addition to restoring the dunes, the project will enhance the visitor experience, build an environmental information center, create a research and education center and rebuild a lodge that was also destroyed by Hurricane Ivan.